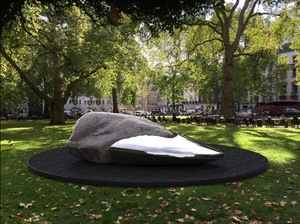 Iain Michael Brunt is delighted to be able to show this work from July 2016 in Berkeley Square, London: The Lost Fragment (a prosthetic fallacy) by Based Upon. Based Upon’s The Lost Fragment (a prosthetic fallacy) is over 3 meters in length, comprising 5 tons of granite and bronze. The work is Based Upon’s second public sculpture, following the unveiling of the 10 metre high A Grain of Rice in Hong Kong last year. The Lost Fragment (a prosthetic fallacy) will preview at Masterpiece London (30th June – 6th July) before showing in Berkeley Square for the remainder of 2016. The work resembles a primitive tool, evoking early notions of man as a productive animal who goes on to trade that which he produces. It questions whether the making of things created a fissure in man’s connection with nature’s wholeness. Until a given moment, nature had taken care of everything and then one day we too became creators. Arrow like, the sculpture points toward the Isle of Skye, the work’s conceptual and physical origin, provoking notions of displacement and homecoming - an ancient and modern episode. The finely sculpted and cast bronze tip speaks of a fix to the crack in the rock. More than wabi sabi, highlighting the preciousness of the imperfection, this is a warning that maybe our ingenious fix for the cracks in nature (most recently of our own making) is only a cosmetic, prosthetic fallacy. “An apparently harmonious marriage of bronze and rock The Lost Fragment (a prosthetic fallacy) hides a deeper truth within its vociferous crack. The work is at once a monument to humankind’s ingenuity and a melancholic musing on how easily we are distracted by our own deftness, missing the vast, ever-present truth as we focus on details we have invented to demonstrate our cunning. The sculpture is launched with the kind permission of Westminster city council and curated by Iain M Brunt of www.gonemodern.com.